Ischia Italy Vacation – Plan a Visit There Now! 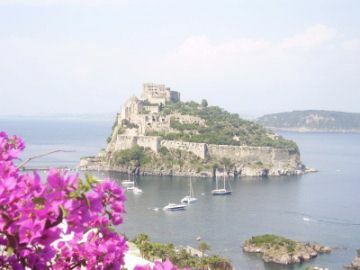 An Ischia Italy vacation is like no other you'll ever experience. But in the wake of a 4.0 magnitude earthquake that hit the Neapolitan island Aug. 21, 2017, some tourists fled. While many all over the island felt the earth move, the damage was consolidated to the town of Casamicciola and some of Lacco Ameno. Two women lost their lives, three children were dramatically rescued after 16-plus hours under the rubble of a building that collapsed, and 2,600 people were left without homes. Still, to visit any of the other towns, including tourist-centric Ischia Porto and Ischia Ponte and Barano, home of the largest beach Maronti, is to have no idea there was an earthquake. You're probably wondering how I could possibly say this so confidently. Well, my son and I were in Ischia less than 48 hours before the earthquake. We had spent the entire summer there. It is the home of my ancestors and husband, who is still there continuing to visit his family. We're in constant contact with family and friends. Now, the natives are angry. They blame journalists for exaggerating the situation and failing to explain the damage was isolated. They don't want them to show the piles of concrete blocking the streets in Casamicciola. While I recognize journalists have a job to do (and it's not to promote vacations on the island), I understand my friends and family, too. Ischia's economy is dependent on tourism. In fact, most of the natives are only able to work six months out of the year. The absolute busiest time is August, especially after Aug. 15, the Ferragosto holiday, and the two weeks after it. Much of Italy – and other parts of Europe – are on vacation. The tourists flock to the beaches of Ischia. But in the wake of the quake, the tourists fled. Many others canceled future reservations. So, Ischia's hotel, restaurant, and shop owners began publicizing the beauty of Ischia. These insiders also explained that the rest of the island is doing just fine, and it's open for business. A campaign that was largely visible on social media went into full effect the day after the earthquake. After all, the year's economy is dependent on it. Celebrities, including Sabrina Ferilli and Laura Pausini, also shared their experiences with Ischia on social media. The point was to encourage people to support the island in its hour of need by spending tourism euro there. Indeed, it is the best way to keep another southern town in Italy from floundering. Beauty – Known as L'Isola Verde or the Green Island, Ischia offers the lushest of vegetation. One of the most striking aspects of the island, in fact, is the green hills dotting the backdrop of the sea. Food – The freshest seafood, fruits and vegetables right off the vine, and the famous coniglio Ischitano (rabbit) are enough of a reason on their own to lure you to the island. The food is like nothing you've ever tasted before. Simply divine. Beaches – Sitting by the sea and listening to the waves pass and the children laughing is like therapy. Curling up with a good book on a lounge chair is relaxing. And people watching while digging your toes in the sand is the best entertainment you'll ever experience on vacation. Thermal Spas – Talk about relaxing! Ischia is a volcano, and its waters and mud have healing powers as a result. Thermal baths, such as Poseidon, Negombo, and Castiglione, have been referred to as heaven on Earth. Frankly, I couldn't agree more. The People – Warm-hearted southern Italians, Ischitani live up to their reputation. They welcome tourists, share their culture and cuisine, and take great pride in their island. Plus, many of them are not bad to look at either. A glance from one of them and you might be wooed to stay even longer. That's basically what happened to me – and I ended up marrying the guy. Who can resist a trip to Ischia? The fact of the matter is that the island offers a great number of treasures. There are gardens to walk, museums to see, and beaches and restaurants to sample. Now is the time for you to go and see one of the most beautiful islands on the planet. Trust me. I know.